In Orford, you’ll experience your first taste of beautiful east coast beaches, including Raspins, Millingtons, Spring and Rheban. Take a stroll or swim or enjoy some of the great walks from Orford, including the coastal walk between Shelley Beach and Spring Beach or the old convict road along the Prosser River. Stop in for a meal or snack at the Gateway Café or Scorchers Pizza in town and pay a visit to Darlington Vineyard for a chance to taste fine east coast wine before taking the 10-minute drive north to Triabunna. You can take a self-guided walk in Triabunna to see the town’s historic architecture, or stroll the Pelican’s Walk along the foreshore. You can also visit the Tasmanian Seafarer’s Memorial and call into the Visitor Centre to see the display of tapestries depicting the town’s history, development and culture. And, be sure to call into Spring Bay Seafoods for a taste of fresh, organic east coast mussels and scallops, stop by the Fish Van to buy fresh seafood and crispy fish and chips or visit Gallery Artspaces for good coffee and local art. There are several walks in and around Triabunna—explore the area’s beautiful beaches or take a stroll in the nearby coastal reserves, including Pelican Walk, which begins near the marina. Take the self-guided Discovery Walk from the Triabunna Visitor Centre to see the town’s preserved convict-era buildings, visit the Tasmanian Seafarers Memorial, and browse the town’s shops and galleries. Or, simply relax with a coffee and snack in a welcoming cafe. Triabunna is also the departure point for the Maria Island National Park—a short boat trip from the marina. You can spend a day or longer on the island visiting World Heritage-listed Darlington convict probation station, taking the short walks to Painted Cliffs and Fossil Cliffs (1-2 hours return) or longer walks to the summit of Bishop and Clerk (3-5 hours return) or Mount Maria (6-7 hours return). Bring your own bike or hire one on the island to explore the national park and see its historic ruins, landscapes and wildlife. Return to Triabunna at the end of the day, or stay overnight in the convict penitentiary rooms at Darlington. 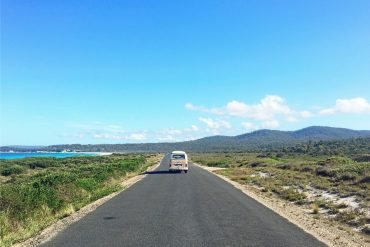 Maria is also the location for the award-winning four-day Maria Island Walk—named as one of the eight Great Walks of Australia. The drive north from Triabunna to Swansea takes around 40 minutes, and is characterised by superb views of Great Oyster Bay and Maria Island. Factor in some extra time to stop and take photos along this stretch of the road, or to take side trips to visit local beaches at Little Swanport, lovely Mayfield Bay and Nine Mile Beach, near Swansea. The convict-built Spiky Bridge, just south of Swansea, is also well worth a visit, as is the delectable Kate’s Berry Farm, where you can pick your own fruit (in season) and enjoy hand made chocolates, ice-creams and tasty meals in the Just Desserts Café. Continue to indulge your tastebuds in Swansea’s cafes and restaurants, like the waterfront Saltshaker Restaurant or The Ugly Duck Out, or try the fresh seafood at Oyster Bay Seafoods in the centre of town. For an indulgent, gourmet dining experience, treat yourself to an evening at Piermont Resort’s fine restaurant (and perhaps stay in one of the resort’s beautiful stone cottages). Make sure to spend some time strolling Swansea’s streets to discover the town’s cafes, galleries and shops, including Artifakt Gallery and Café, and the Bark Mill Museum—call into the Bark Mill Tavern and Bakery for a tasty snack or light meal as well. Distance Orford to Triabunna: 7.5 km/5 mi. Driving time: 10 minutes. Distance Triabunna to Swansea: 50 km/31 mi. Driving time: 40 minutes.